The American academic Richard Florida has gained international attention for his theories about the “creative class”. According to Florida, the key to urban success lies in attracting certain groups of people, such as artists, scientists and twenty-something singles. Florida insists that this can be accomplished through nursing a specific type of culture within a city: hip cafes, art galleries and other manifestations of indigenous street-level culture. Florida’s theories have become rather popular in Sweden, the country which tops the list of his creativity index. In a recent study about urban development in Sweden, we have found that Florida’s ideas mainly attract the political left. The Social Democratic Party, as well as the former communist party, embrace Florida’s ideas on their party web pages. The Social Democrats go as far as to quote Florida in a parliamentary bill. In Sweden, Florida’s ideas are used by those who wish to argue that public funding of cultural events, rather than a competitive business climate, is the way to achieve economic growth. These urban planners quote Florida in their development strategies, shifting focus from business friendly reforms to attracting “unusual shops” in order to bring development to communities struck by high unemployment and other social ills. Swedish cities thus risk choosing the same strategy as Berlin, where the focus of administrators for many years has been to attract art galleries, fashion shows and hip cafes, but where basic conditions for development have been neglected. The bureaucracy in Berlin has a less-than-business-friendly attitude, and taxes for those with typical means of income, as well as for entrepreneurs, remain high. The result of these policies, aiming to market Berlin as “a city of glamour” to attract the creative class, has been rampant unemployment. Between 2000 and 2006 The European Union spent close to 2 billion US dollars (1.3 billion Euros) to attempt to curb the economic crisis in the city. Florida has, together with two Swedish co-writers (amongst others), recently published an index of creativity in Swedish municipalities. The results of this index are interesting to examine. In accordance with observations made by Harvard Professor Edward L. Glaeser, Florida’s definition of the creative class builds upon the inclusion of well educated people; municipalities with high percentages of educated people are defined as being creative. However, in many cases, the rankings in Florida’s Swedish index have little to do with actual creativity or the fundamentals for growth and progress within a municipality. Among 290 Swedish municipalities, the one best fitting Florida’s criterion of creativity is Södertälje. This is quite astonishing, since Södertälje is seldom seen as a role model for other municipalities. Among the 26 municipalities in the Swedish capital region, Södertälje has the second highest unemployment rate. The business climate there ranks, according to the Confederation of Swedish Enterprise, as only the 199th most business friendly amongst Swedish municipalities. The municipality in the capital region that has the highest unemployment rate is Botkyrka. It is number 233 in business climate. In Florida’s index, however, Botkyrka gains a respectable position as the 22nd most creative municipality. While places with failing business climates, high unemployment, high crime rates and overall failing development can be ranked as highly creative in Florida’s Swedish index, actual creativity is not always acknowledged. Gnosjö is a small Swedish municipality made famous by its frequent use as an example of how a spirit of entrepreneurship can lift up a community. The unemployment rate is much lower in Gnosjö than in the rest of Sweden. Gnosjö is indeed full of creativity, but in Florida’s index it only ranks as the 141st most creative municipality. Florida’s index fails to catch the real origins of creativity and cultural development in Sweden. Abroad, many believe Sweden to be the very showcase for social democratic welfare states. However, ambitious reforms implemented during the past few decades have transformed Sweden into a competitive economy with an increasing degree of economic freedom and strong growth. In the wake of this development, culture, fine food and the arts have all blossomed in Swedish cities. 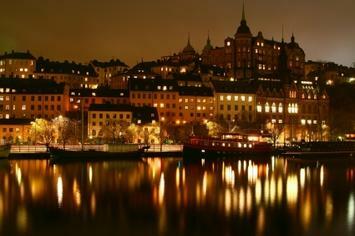 Tourists, as well as businesses, are attracted not least to the capital city of Stockholm. The strategy underlying this development has been based on a sound business-and-growth-friendly policy orientation, not a Berlin style emphasis on public subsidies of culture over families and businesses. Cultural development has occurred as the result of a growing economy, not the opposite. Nima Sanandaji is President of the think tank Captus. Johnny Munkhammar is President of the consulting agency Munkhammar Advisory. They are authors of a report for the Stockholm Chamber of Commerce about urban development. Peter Egardt is President of the Stockholm Chamber of Commerce.